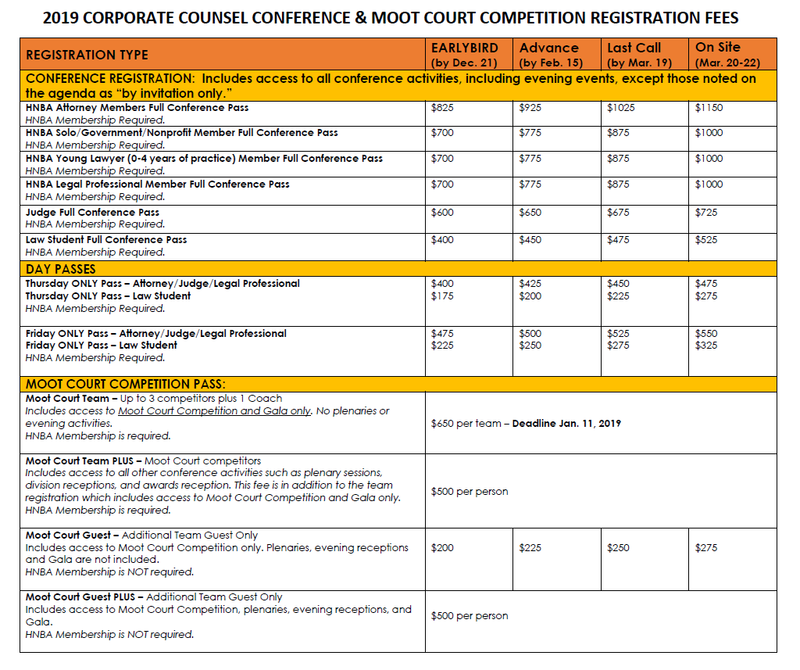 Early Bird Registration for the 2019 HNBA Corporate Counsel Conference & Moot Court Competition is now open! PLEASE NOTE: In order to register for the Conference, you must be an active, dues paid HNBA member. If you are not already a member, click here to join. To view our registration fees and requirements, please click on the image below. Please note that you are not considered registered until registration payment is received. Payment must be sent no later than 2 weeks from submitting this registration. If we do not receive payment in 2 weeks, your registration will be removed and you will no longer be considered as “registered” at that specific rate. Requests for refunds for your registration must be received in writing (75% of total registration will be refunded to cover administration fees). Any requests received between February 24 – March 4 will be subject to a 50% refund. No refunds will be granted thereafter. All substitutions must be submitted in writing to Erika Lopeztello at elopeztello@hnba.com. Your participation in any HNBA conference is at your sole and exclusive risk. The HNBA may refuse admittance, may charge an admittance fee, or ask you to leave the conference at any time for any reason. 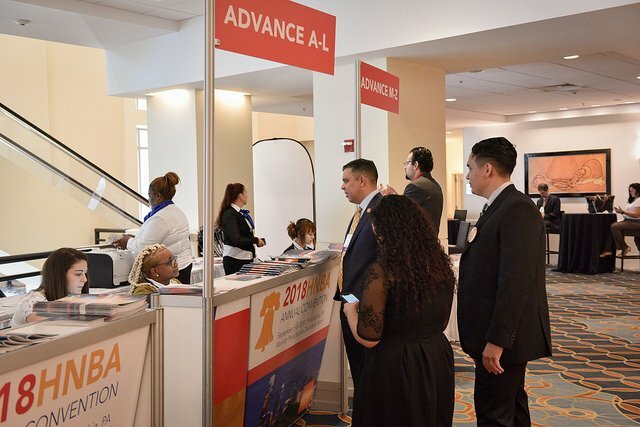 By attending the conference, you agree and understand that in connection with your participation in any event or activity, you may be exposed to a variety of hazards and risks, foreseen and unforeseen, which may or may not be inherent in those activities and events. These inherent risks include, but are not limited to, the dangers of serious personal injury and property damage. You agree and understand that injuries and damages can occur by natural causes or by the acts of other persons or third parties, either as a result of negligence or because of other reasons. Furthermore, the HNBA has not tried to contradict or minimize your understanding of these risks. Notwithstanding anything to the contrary herein, to the fullest extent allowed by law, you agree to waive, discharge claims, release from all liability and indemnify and hold harmless the HNBA, its affiliates, officers, directors, agents and other partners and employees, from any and all liability on account of, or in any way resulting from, injuries and damages in any connected with any conference events or activities. You agree and understand and intend that this assumption of risk and release be binding upon you and your heirs, executors, agents, administrators and assigns, and includes any minors accompanying you at the events. Business attire during conference activities and Black tie attire for Gala.